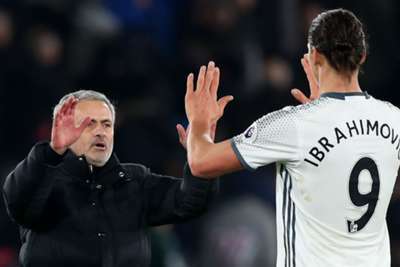 Zlatan Ibrahimovic launched an impassioned defence of under-fire Manchester United manager Jose Mourinho, adamant no coach can work miracles and the players are to blame for their recent woes. Mourinho has attracted significant criticism this season due to United's poor start to the campaign, winning just five of their 11 matches across all competitions. "Jose is doing a good job, you're as good as your team," Ibrahimovic told Sky Sports. "There is no coach in the world who can do miracles with a team. "Of course, results speak for themselves. The results are not on top, it goes bad, sometimes goes better, it's part of the season. "But the Premier League is not easy and if someone knows how to win it, it's him. So, like he said himself, [he has] more Premier League [titles] than all the league's coaches won together. "Everybody criticises Mourinho and I don't think it's because of the results, it's because of the character, because of the way he is. "I see myself also a little bit in that situation, we have our confidence, we believe in things, we say certain things. In our own way. "Of course, we get the blame, we get criticised more when it is not going good, but when it is going good and we win, the satisfaction is bigger than the other ones that are political, think they're perfect and want to be no trouble for the media so the media never attacks them. "That is not us, we are ourselves, we believe in what we do and we do it until the end. "Some critics I feel [are] personal, some critics are exaggerating, some because of the way he is, some because of jealousy, but all this is part of the circle. "Mourinho just has to keep being himself, stand up for what he is doing, stand up for what he is. He is there because he did it his own way, because he is who he is and don't change for anybody."